I expect a lot of people get sick of me wittering on about fishing at dawn and dusk. 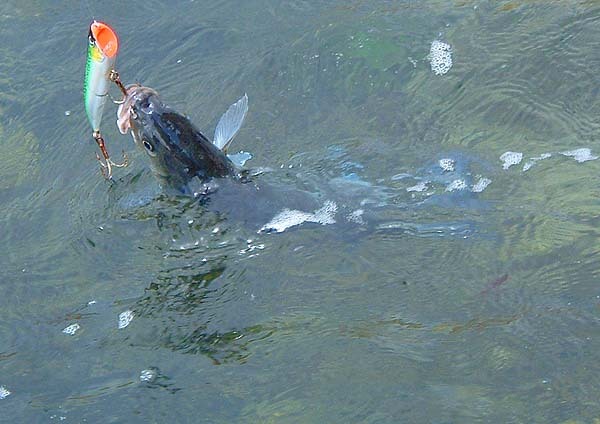 Despite the sort of evidence shown in Tactics page 105 fish do eat at other times. In fact lots of fish will have nothing to do with the change of light. 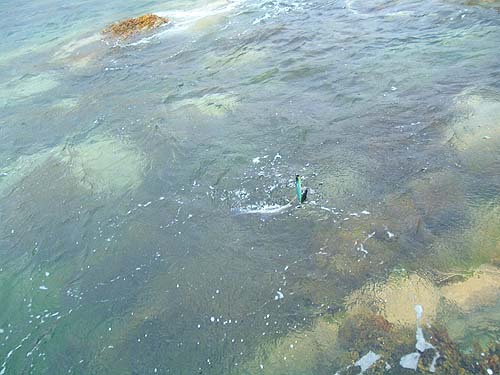 Congers, pouting and dogfish are largely nocturnal while wrasse and mullet feed mainly in the hours of daylight. Even these patterns are not 'hard and fast and there are frequent exceptions to the rules. What I'm really trying to say is that there is no time of the day when it is hopeless to fish. 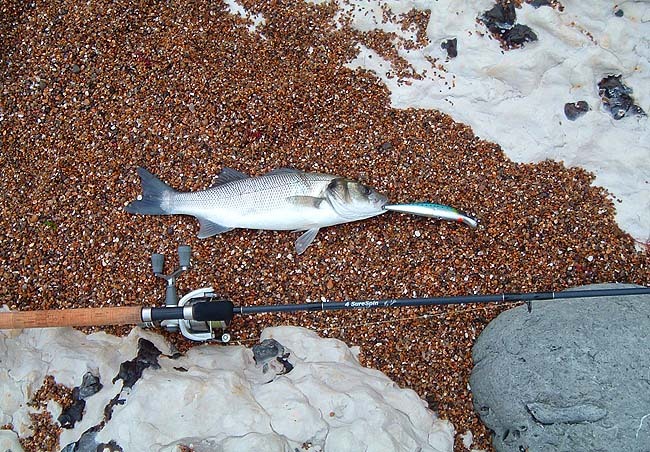 If you live miles from the coast and find it difficult or impossible to fish when you would like to don't despair. Even though I am only fifteen minutes from the sea and prefer to fish short sessions when I think that the conditions are good there are many occasions when I can't get away or when I simply fancy a spot of fishing. The other day was a classic example. 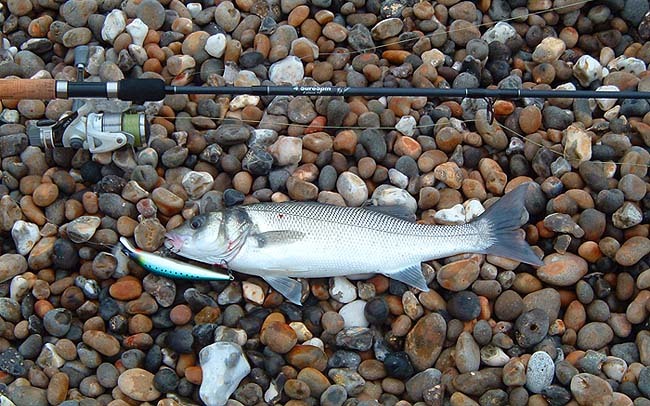 Nigel told me that he had caught a couple of bass from a local shingle beach by fishing bait in the evening. More interestingly he had also lost a big fish which took a live pouting. I'd been unable to go fishing for a couple of days and was keen for a 'fix'. I had a couple of hours spare from 10am to 12am and decided to give it a go at Nigel's spot. 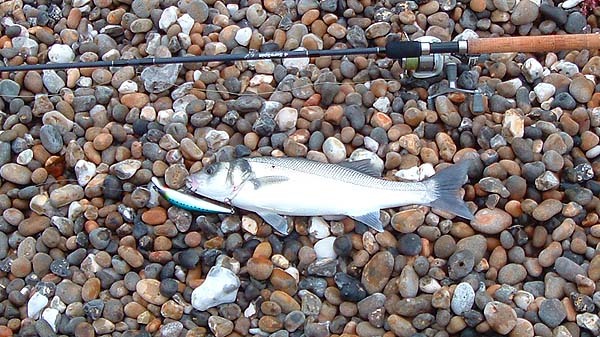 To cut a long story short I plugged the length of the shingle beach and back in the two hour session and I had two bass. Neither was of great size but both took fiercely, fought hard and gave me my fair share of excitement. This success stimulated me to see what I could catch during the daylight hours and a couple of days later I went to the same beach - mid-afternoon on a bright, sunny, warm day. There was a strong (force 5-6) onshore wind this time and the beach was full of holiday makers so I opted to fish off the rocks at one end of the bay. 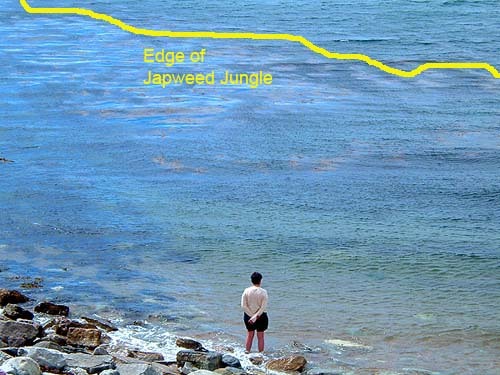 It was rough and difficult to cast once I got away from the shelter of the cliff and the water was full of japweed right up to the surface for about twenty metres out. To avoid the weed and save lures I put on a big slider. About fifteen minutes after I started I saw a splash by the lure that was more than my usual pop! Next cast there was another splash and this time the rod bent into a fish. To tell the truth it did not put up much of a scrap (just as well since I had to drag it through the japweed jungle) but I was well pleased to have landed a bass under the conditions.